A glorious morning yesterday at the Worton Organic Garden and Farm near my parents’ house in Oxford. I brought back purple sprouting broccoli, basil, multicoloured tomatoes of many different shapes, and, most excitingly of all, a couple of freshly harvested, locally grown Chinese vegetables! It turned out they were growing the prickly Chinese variety of cucumber for its exquisite flavour (it’s much less watery than a typical European cucumber) and soybeans. They also had a row of Chinese chives 韭菜 in their hothouse – not enough, they said, for commercial use, but growing enthusiastically. The budded chives stems 韭菜花 are particularly good stir-fried with a few slivers of marinated pork; the chives themselves in dumpling stuffings or made into omelettes or scrambled eggs. I boiled the soybeans, green and tender in their bristly pods, and we ate them before lunch, with a sprinkling of seasalt. 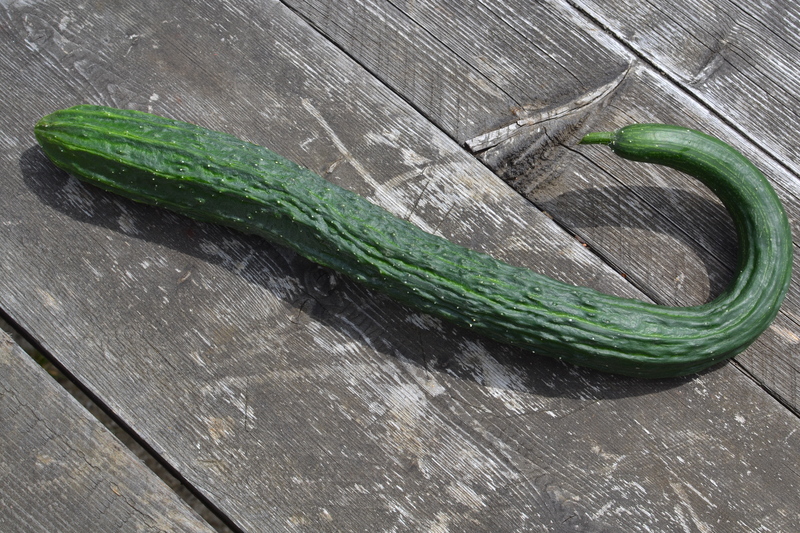 The cucumber will find its way into a spiced Sichuanese salad 炝黄瓜 very soon. I did ask owners of the farm if they’d considered growing wo sun 莴笋(known in English as celtuce or stem lettuce), which is one of the most versatile and subtly delicious of southern Chinese vegetables, but unfortunately they said it didn’t much take to the English climate, and that their attempts to nurture it had fizzled out. Later in the year, they tell me, there will be plenty of pak choy and gai lan… I can’t wait. 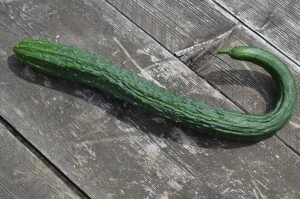 Do any of you blog readers grow your own Chinese vegetables? If so, which ones? This year, I have been growing stem lettuce, Shungiku, Pak Choi and Chinese Chives. The stem lettuce and shungiku both thrive here (in Denmark) – I can’t think why it would be more difficult to grow them in the UK, where the climate is even milder. The pak choy on the other hand has been a failure, maybe I should have sown it later as they seem to have done at Worton Organic farm. I havent had much luck with the chinese chives either. I have been treating the Shungiku more or less like spinach, while so far I have only eaten the leaves of the stem lettuce. What do you suggest to do with the stems? We brought back from Hong Kong a packet of Angular Sponge Gourd seeds. Haven’t tried it yet, but if successful would you know how to cook it? Pak choi we have had success with though. I thought I had done a blog post about stem lettuce, but clearly I never got around to it! I will try to post some information soon. Basically, though, you start by peeling the stems and discarding any fibrous parts. Then you can cut into slivers, scrunch in a little salt, leave to drain and then use as a salad vegetable; cut into thin slices or slivers and stir-fry, on their own with a little salt, or with meat or other vegetables; or cut into chunks and add to stews. Let me know how you get on! I like to peel the gourd and cut it into chunks; then stir-fry some sliced garlic until fragrant, add the gourd and continue to stir, adding a little chicken stock and salt and pepper to taste. You will end up with a soft, soupy and very savoury dish. If anyone knows where I can get Hunan chili pepper seeds, I’d really like to grow those also. Cool, I’m growing chinese vegetables in Italy, mainly winter varieties though have some asian type eggplants, japanese green peppers and yes Celtuce. Gai lan to but that was a mixed succes, mustards on the other hand grew like mad, fantastic plants to look at. I’m hoping to find some chinese chilli seeds for next year. Oh and I grew two szechuan pepper bushes from seeds. I have grown facing heaven chillies and, after a long wait for them to ripen, most are now pickling in spiced brine in a large Kilner jar in the fridge – an attempt to make my own pickled chilli paste. I am also trying to grow ruby-coloured pak choi sown late in the season. I grow 韭菜, chinese chives and the prickly cucumbers (in a hanging basket). All manner of pac choi, baby pac choi, gai lan and other chinese greens are grown by local asian (mostly Vietnamese) farmers and sold in farmers markets. Oregon has a climate with a long growing season and mild winter, so I usually have produce year round. I am planning to grow pak choi in my new allotment when I get back from holiday. As far as the other varieties of Chinese veggies go, I am seriously keen to give them a go. Does anyone know of a good seed company that have a choice of the above mentioned vegetables in seeds? I am a massive fan of cucumber and look forward to reading the Sichuanese cucumber salad recipe Fuchsia! does anyone have a website with good information on how to grow these in pots? I managed to grow 韭菜花 in my garden, also Pok Choy – which stayed really small, and other mustard greens but those turned too bitter. Last year I tried to grow celtuce, but it somehow never got to the right stage- there was no real stem to speak of.. Would love to grow some huajiao but would rather try from stem instead of seeds. I’ve grown chaotian jiao (facing-heaven chillies) indoors from Sichuanese seeds – they multiplied like crazy, but were unfortunately as popular with the greenfly as they were with me! I used the cucumber salad recipe from my Sichuan book. And the cucumber was as flavourful as expected. My little Sichuan pepper tree seems to be doing well in my parents’ Oxford garden! I’ve no idea how long it will take to fruit. I tried to grow stem lettuce this year and has given up. It’s obviously not hot enough here. In China it is a late spring vegetable…. I grew and have harvested amaranth vegetables from seeds. They are delicious in soups or just sauteed with minced garlic. Usually, you can find these growing wild in fields where horses and cows are reared. This winter, I am going to start some sweet potatoes off in the house, and come summer, plant them in tubs. If you have never tried sauteeing sweet potato leaves with minced garlic and sambal, you should. It is yummy! Wow! The chinese cucumber looks amazing! Great tip to look for that market in Oxford! Thanks for sharing. Would love to taste this immediately. I have grown pak choi and you cai – unfortunately the slugs love it so it has been a real battle. Asian aubergines have been quite succesful this year, and they just taste better than anything one can buy. And a couple of months ago I planted a small Sichuan pepper tree, am much looking forward to seeing how that is going to turn out. I live in California, and tried celtuce but it died almost as soon as it sprouted. I’m considering trying it again, but leaving it indoors this year. I’ve also tried garlic stems from the “soft neck” garlic, but it was inedible. Have you had any luck growing suan tai? If so, what variety of garlic did you use? RE: celtuce, it’s nonsense that it doesn’t like the English climate. Celtuce is a spring vegetable in China but it grows just like lettuce in the UK, as a summer vegetable. I live in the North nearly the chilly Pennines where we often get April/May snow yet my celtuce always grows well. Just watch out for the slugs. Harvest time is more likely to be early autumn. 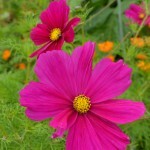 They do require a bit TLC at the beginning i.e sowing undercover, transplanting and hardening off etc. 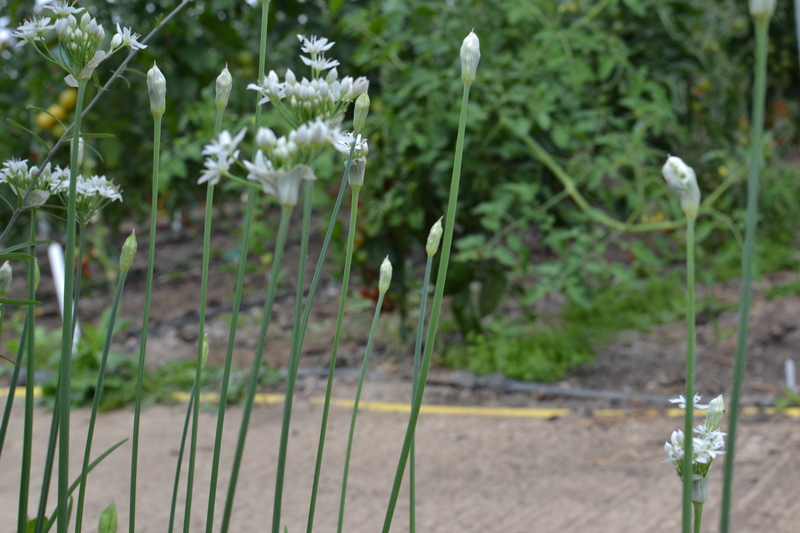 Chinese chive is extremely easy to grow in the UK. You just need to be patient and wait for a couple of years before it gets established properly. Afterwards it’s pretty low maintenance. 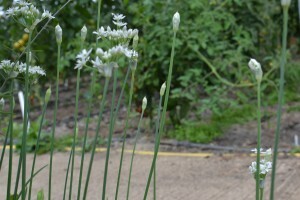 Normal Chinese chives are the same – they are turning into weeds in my garden. Garland chrysanthemum is again extremely easy to grow. 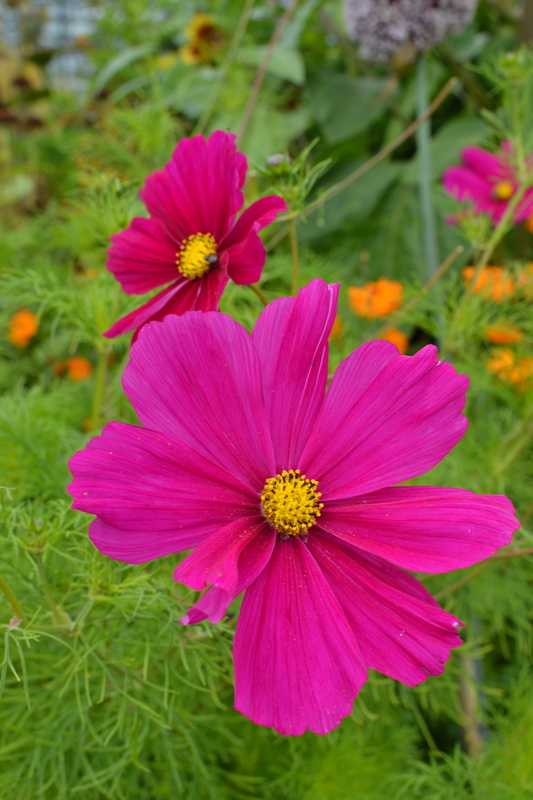 Make sure you sow in late summer/early autumn to avoid bolting, scatter the seed into the soil and forget about it for a couple of months, that’s all. I also highly recommend pea shoots – no indoor sowing or transplanting needed, low maintenance and almost pest free. I start sowing directly outdoors in mid-April onwards and can harvest up till mid July. Mooli radish is another easy one. I also grow wild rocket and land cress that can be used in Chinese cooking instead of shepherd’s purse. You can of course grow shepherd’s purse, as well as alfalfa greens – commonly eaten in Shanghai as a leafy green. You can also grow anything of the brassica family, such as pak choi or kai lan in the UK. Although I only tried a few times then didn’t bother afterwards because of all the pests associated with them. I am a “lazy” gardener lol. I’ve done amaranth this year so let’s see how that goes. I don’t have a greenhouse and living in the North means there really isn’t any chance of growing Chinese cucumber or aubergine. Still, there are plenty of veg you can grow. es0u0164 – Fascinating, thanks very much for all this information!